Home Income Opportunities	Why Have So Many Americans Never Traded Options? Bring up options trading in a conversation and you’ll likely to get a mix of confused faces and blank stares. Basically, options aren’t the cool kids of the investing world. 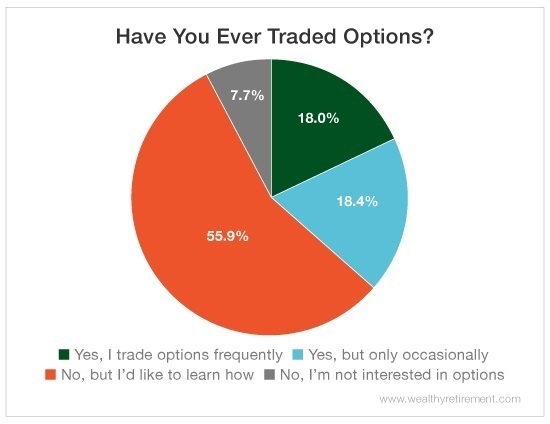 Just take a look at our survey results: More than 60% of Wealthy Retirement readers have never traded options. And of those who have, only 18% do so regularly. Because while options trading is a bit more complicated than your typical “set it and forget it” strategy, if you do it the right way, you have the potential to generate incredible returns. After all, high risk can equal high reward. Plus, with an options contract, you’re paying a lot less money upfront than you would be by purchasing shares outright. Trading options isn’t JUST for the pros either. If you’re part of the majority of our readers who want to learn how to do it successfully (and if you have a healthy risk tolerance), start with some of these resources. And remember: When it comes to your money, you always have options… literally. Disclaimer: Results and data are courtesy of a survey of Wealthy Retirement readers.